I work for Ojo Customs. Nick Berg, our CEO was approached by his business partner The Escape Pod to build the gun share project. 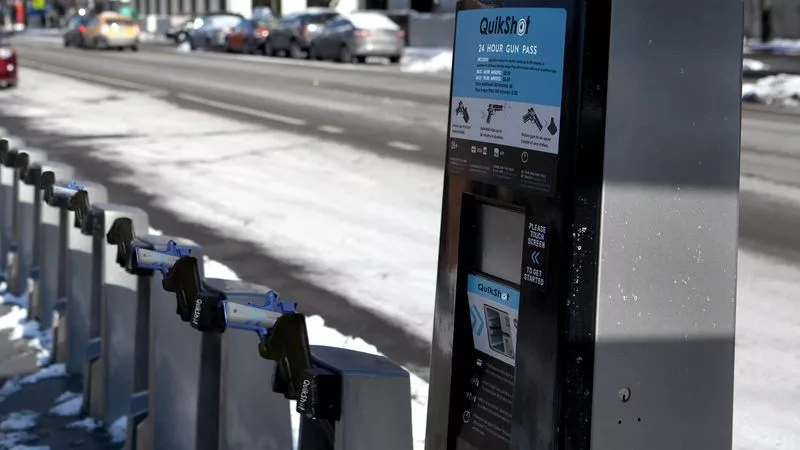 It plays with the concept of a bike share, which is now so prevalent throughout the city and the country that it is identifiable and recognizable to everyone who lives in and visits the city. 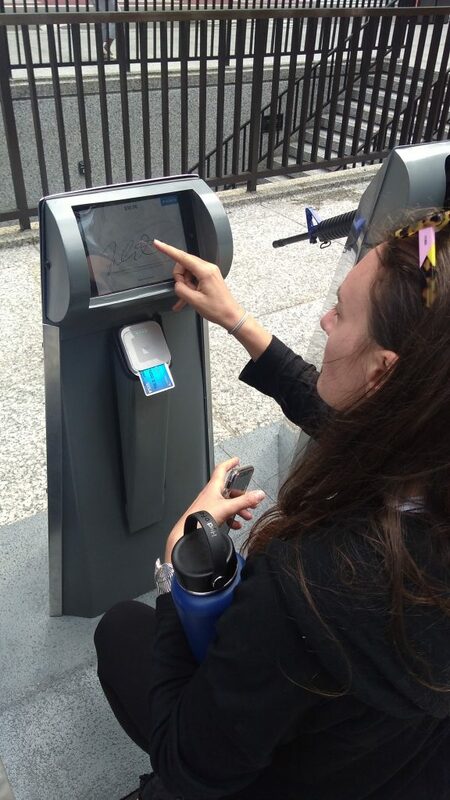 The concept of a bike share program, which allows anyone to pick up any bike from one of the many stations located throughout the city, use it as one pleases, and return it to any other station in the city, has proven to be a workable system that people around the world have adapted to. 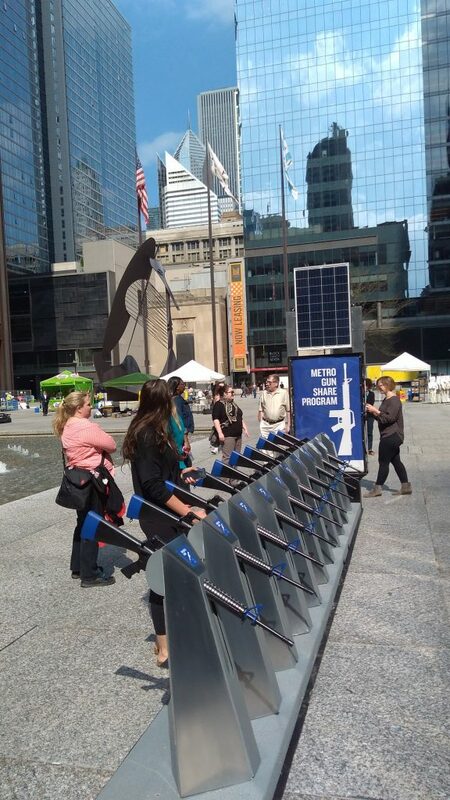 When the concept is applied to guns, however, it becomes a powerful statement that deadly assault weapons are just as easy to obtain in Chicago as a Divvy bike. Nick Berg did an interview with WBBM describing how the installation was made. Ojo has also made a Reel Chicago was there at the unveiling and did a piece using the mock up image The Escape Pod rendered when they proposed the project. The real thing looks much more impressive. You can see the similarity in the Escape Pod’s 3D rendering to one in an Onion article about the same idea back in 2015. I have no idea if the onion article in 2015 inspired The Escape Pod, but I do know they did something about the idea first. This is the most impactful and meaningful project Ojo Customs has done to date. 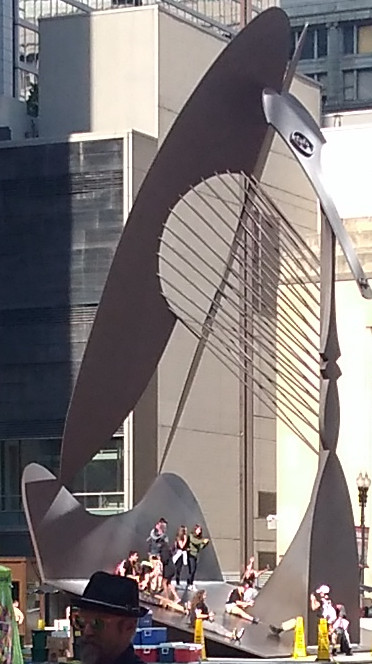 I found it personally inspiring to contribute to a piece of art on display in the literal shadow of the Picasso sculpture on Daley Plaza I used to play on as a kid growing up in Chicago. In the foreground of the picture is Nick Berg, Ojo Customs CEO. Sited static caravans for sale north yorkshire In the background, though, you can see a field trip of school children sliding down the Picasso sculpture facade. The kids later walked by the Gun Share Project. I wonder what they thought as they saw replicas of the same assault riffle that Nikolas Cruz legally purchased and used on the victims at Stoneman Douglas High School on Valentine’s Day this year. The AR-15 was chosen to the replica used for the gun share because it was used in the Parkland shooting and Las Vegas massacre, as well as so many other mass murders in America recently. The installation is interactive. People can are encouraged to engage with the replica riffles. Some spectators gave the guns a pull and realized they had a little bit of a give, without knowing that was by design. 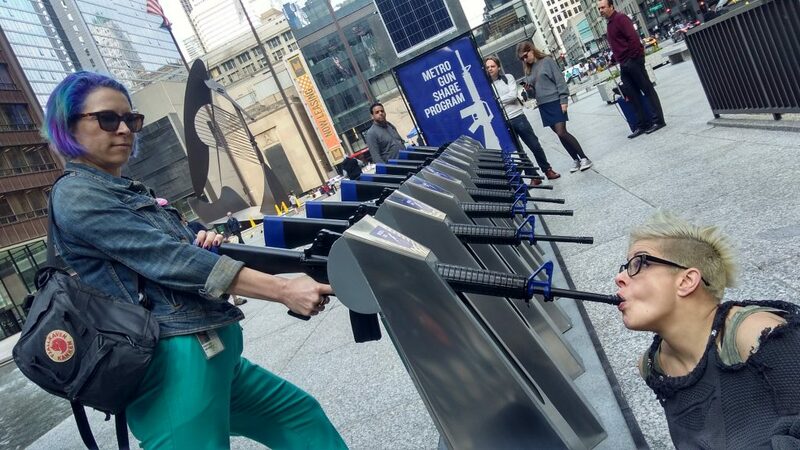 It startled quite a few people, but the guns are fake and welded into place. There’s no getting them out of their respective racks. The Brady Campaign teamed up on The Metro Gun Share Project. The Brady Campaign is the on-going effort to cut gun deaths and has brought about the Brady Handgun Violence Prevention Act, which, among other things, imposes a mandatory 5 day waiting period after someone purchases a firearm in the US before they can actually attain the weapon. 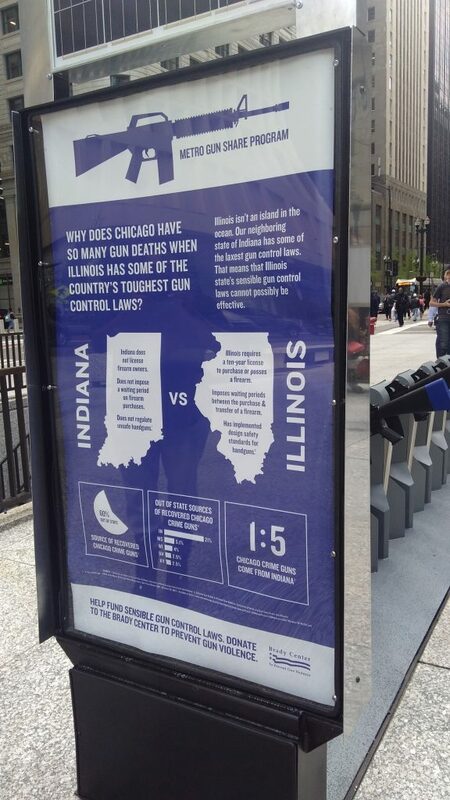 There was an interactive kiosk where participants could donate to the Brady Campaign next to a sign that described the strict gun laws in Illinois vs the relatively lax laws in Indiana and comparinh the higher gun violence rate in Illinois (especially Chicago) to the lower rate in our neighbor state. While the Brady Bill was the first of its kind to introduce prohibitive measures in an attempt to reduce gun related violence, it was only a small step in the right direction. Nikolas Cruz passed all the requirements to legally purchase the firearms he had when he shot up his former high school in Parkland, Florida. He even waited 5 days. The Brady Campaign is fighting for stricter gun control laws that make it harder for people with mental illness and a history of violence to legally obtain firearms, like Nikolas Cruz. Most of the guns involved in Chicago violence are illegally obtained, however, and come from states with less strict prohibitions in gun laws, like Indiana. 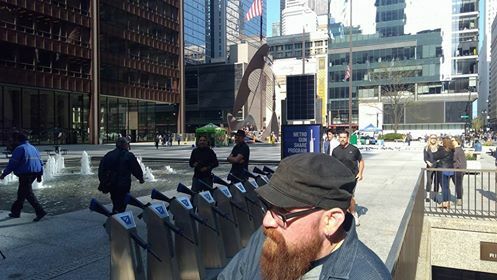 The Escape Pod came up the concept and are responsible for allocated its temporary placement in such a public forum as the Daley Center. 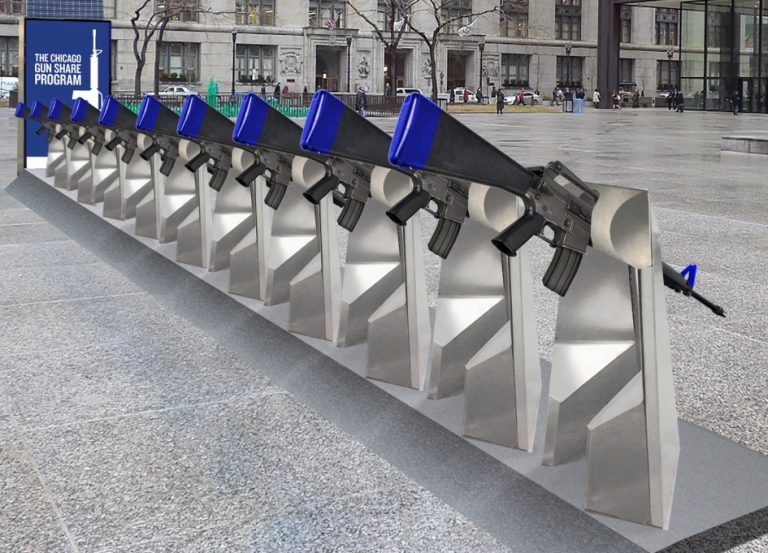 I know they have schemes of moving the Metro Gun Share around the city, possibly in front of the Art Institute. There had been talk about having it on display somewhere public during Lollapalooza later this upcoming summer. Stephen Paddock, the “Vegas Shooter”, indiscriminately fired at a crowd of 22,000 people attending a country music festival on the Vegas Strip on October 1 last year, shooting 400, and killing 58 of them. 23 rifles were found in the shooter’s custody when Las Vegas authorities discovered his body in the hotel room from which he took so much life, including his own. Of the guns recovered, several were AR-15s. Paddock had originally intended on carrying out a mass murder at Lollapalooza in Chicago, 2 months before. Having the gun share project at the festival this year would be a loud reminder and a statement that not enough has been done to prevent gun violence and mass shootings in the future. “The answer to gun violence” seems like hyperbole to me. It’s not a calculus problem that can be solved with a formulaic and logical approach. The Metro Gun Share project does not attempt to present answers, but invites people to pose questions. Only by enough people speaking up, and asking questions to each other and of our representatives, can we work together towards controlling the widespread violence that manifests from mass shootings in America.